Francis was born on 21 August 1567 in the family castle of Sales, in Thorens in the duchy of upper Savoy. He was the firstborn child of Francis and Frances De Boisy. His father was forty-four, and his mother fifteen. There were twelve children born to the family, five of whom died soon after their birth. Francis' studies were lengthy and were accomplished in three stages: college studies at la Roche and Annecy (where his priestly vocation was born); then at the Jesuit college in Paris; and finally at Padua, where in 1591 he obtained his doctorate in civil and canon law. During these years he also studied theology. He was a gifted young man: of brilliant intellect, persevering, purposeful, serene, affable, irresistibly charming, and above all, consumed with the love of God. Our studious young man showed no interest in the prestigious betrothal and political office offered to him, and thus dismayed his father who had nursed visions of social grandeur for his firstborn. He was appointed to the chair of the Annecy cathedral chapter, and was ordained priest on 18 December 1593. His early years of priesthood in the Calvinistic district of Chablais were largely coloured, perforce, by extraordinary missionary controversy. He preached with courage, and his technique of patient dialogue and prayer was to prove a determining factor in the return of Thonon and Chablais to the Catholic faith. His bishop sent him to Rome on diocesan business; and on 24 March 1599 he was appointed coadjutor bishop at the age of thirty-one. In 1602 he journeyed to Paris to organise the restoration of Catholic worship in the Gex area, part of his diocese and now reverted to French jurisdiction. Francis accomplished this task in nine months. Francis was ordained bishop on 8 December 1602 and became the good shepherd amongst his people. He was tireless in visiting his 450 parishes; he organised the further formation of his clergy, proclaiming that learning was the eighth sacrament for a priest. He concerned himself with the reform of monasteries, and the catechesis of the young. He spent hours in the confessional, dialogued with the Calvinists, preached the Advent and Lenten homilies in many cities in Savoy and France, undertook spiritual direction both viva voce and in correspondence, took part in theological discussions, and with his friend Senator Antonio Favre founded the Florimontane Academy; and in the midst of this multitude of activities he found time to publish in 1608 his Introduction to the devout Life (Philothea) and in 1616 his Treatise on the Love of God (Theotimus). At Dijon in 1604 he met the Baroness Jane Frémyot de Chantal, aged thirty-two, and a widow with four children. Between these two saintly people there developed a strong spiritual friendship. In 1607 Francis suggested to her an important project: the founding of new kind of Order of Contemplative Sisters that would include the care of girls and widows, and be permitted to leave the convent to visit the sick and the poor. The Order was founded on 6 June 1610; but in 1618 the very strict canonical rulings of the day were insisted on by the Primate of France, Denis Marquemont, and all aspects of the external apostolate were suppressed. Duke Charles Emanuel I of Savoy sent Francis to Paris to press for the marriage of the hereditary prince Victor Amadeus with Christine of France, the sister of the young King Louis XIII. Francis spent some ten months in the Capital. Despite being assailed by a mess of intrigues he engaged in an intense missionary program: tireless preaching, meetings with Vincent de Paul, Mother Angelica Arnaud and Richelieu. He also founded a convent of his Visitation nuns, and declined to become the coadjutor of the Cardinal Archbishop. In 1622 he was obliged to undertake another painful journey: to go to Avignon to the members of the royal family of France, and accompany them via Rodano to Lyons. He was a guest at the Bellecour convent of the Visitation Sisters at Lyons and there met the Reverend Mother Jane de Chantal for the last time. Francis died of a stroke on 28 December 1622. His funeral was solemnised at Annecy on 24 January following, and his remains transferred to the Visitation Convent. Francis was canonised on 19 April 1665 by Alexander VII; many years later in 1877, Pius IX declared him a Doctor of the Church, the first French-speaking member of that august assembly. Such is the resumé of the life of our patron, a life full of extraordinary splendour and benevolence. In the following pages we shall endeavour to present the principal features of this remarkable saint and seek to understand why Don Bosco was inspired to choose him as our model and protector. Francis de Sales is not as well-known as he should be. Traditionally he has been accepted as a theologian, a mystic, a spiritual writer, a director of souls, the founder of a religious order. Assuredly he has been all these things, and magnificently so. But none of these qualifications is an actual description of him. In fact, all these activities were carried out within a more profound activity: that of a bishop. To judge him correctly, we need to see him above all as a great man of action, an apostle devoured by zeal, a bishop goaded on by a vivid awareness of his responsibilities as a shepherd of souls, totally dedicated to the people God had entrusted to his care. The main interest of his spirituality derives from the fact that he formulated a doctrine, a psychology and a mystique of Christian activity. In him we find a marvellous fusion of two characteristics that are rarely seen together: astute thought and intense activity, all inspired by a spiritual life of extraordinary distinction. The brief summary of Francis' life above shows clearly what was dominant in his life as pastor, priest and bishop. He died at a relatively young age: 55 years. He had been ordained priest at 26, after long and toilsome years of study at Paris and Padua. There were left to him only 28 years of ministerial activities: five as a priest, four as a missionary in the Chablais, and twenty as Prince- bishop of Geneva. One could say that his episcopate was his life's work. It should be realised that his service was intense and animated by the fact that he lived in a time fraught with complexities. His apostolic life was closely bound up in the policy of his prince, Duke Charles Emmanuel of Savoy, who wished to eliminate the religious dissensions rampant in his Duchy. However, in 1601, the Treaty of Lyons restored a part of the diocese of Annecy (Gex) to France, and this obliged consultation also with the French Government. Francis had to negotiate with political authorities (Henry IV and his courtiers), and religious authorities (the bishops); he also had dealings with some of the spiritual giants of the day (the extraordinary mystic Mme Acarie, Pierre de Bérulle, Vincent de Paul). Twice he was offered the archbishopric of Paris! Besides all this, he was the bishop of Geneva, but exiled in Annecy. He thus found himself at the centre of divergences between Catholics and Protestants, and the controversies raised by the Reformation. He laboured ceaselessly for reconciliation, for the spiritual return to unity of the faith in his episcopal city. The Council of Trent had concluded in 1563, four years before Francis was born; but even by 1600 the Catholic Counter-Reformation had not influenced many of the ambitious and ignorant members of the clergy. The monasteries were still in spiritual decline; the Christian populace hardly evangelised. It was Francis' aim to accomplish at Annecy what Charles Borromeo (1538-1584) had done in Milan. Moreover Francis lived in the age when the fruits of the Renaissance were readily available - that imposing era that made such forceful demands on the bettering and perfecting of forms and structures bequeathed by medieval and feudal times. Francis was a `modern' of his day, and seized on these new venturous aspirations. They were, however, difficult times for Francis to carry out his pastoral duties, and to lead his flock along the path of holiness. Already from the year 1534 the city of Geneva had become the bastion of Protestantism, and Calvin had conquered the whole region. The Catholic faith was suppressed with raids, pillaging and massacres; churches were destroyed, worship forbidden, priests exiled or done to death. In Francis' day the Chablais had been gripped in the jaws of Calvinism. Theodore Beza, Calvin's successor, reigned supreme. Peaceful advances proved uncertain, nay, futile. Catholics in Upper Savoy lived in discouragement and dejection. Francis had arrived there with few belongings - among them his Breviary, Bellarmine's Catechism for his homilies, a Bible for reference and explanation. The young missionary had to face distrust and inflexibility - he was even threatened with menaces and execution for his audacity. However, in his initial efforts Francis set out to gain the goodwill of the simple and humble folk. His first sermon boasted a congregation of one old lady, to whom he remarked that one single soul was worth a whole diocese. Then came the moment of God even for the most intractable of his listeners. Whilst his first public discussions had invited head-on clashes, his individual chats on a one-to-one basis were able to overcome distrust and lead to a gradual openness of heart and mind. Even the militant fanatics yielded to Francis' gentle and persuasive preaching; he instructed them with conviction and they were won over by his teaching - secretly at first, but eventually quite openly. Francis humbly recognised the change, and did not hesitate to write to Clement VIII that when he arrived in the Chablais he had found only 100 Catholics; now only 100 Protestants could be found. In a way, Francis anticipated the directives of Vatican II. Right from the beginning of the Counter-Reformation, in his meetings with his separated brethren, he did not did not assume the controversial tone usual at that time. Our able warrior made use of quite different weapons: kindliness and understanding. Francis viewed his opponent as a soul to be saved. This is the only way one can explain the mass conversions of the young bishop. In the words of Du Perron, one of the friends of the saint: `If you want heretics to argue, send them to me; but if you want to persuade them and convert them, send them to the Bishop of Geneva. One of Francis' first Masses celebrated in mission territory was in honour of the Holy Spirit. Indeed, it was during this ceremony that a brilliant idea occurred to him. `If my opponents will not lend me their ears, then I must win over their eyes to read what I write.' He then composed the so-called `leaflets', the actual forerunners of modern advertisement placards and propaganda circulars. Francis' pamphlets proved a rapid way of spreading his message - a resumé of the truths of the faith - catechesis in a nutshell. The youngsters he had befriended were overjoyed at being part of the plot, and were his willing couriers. Leaflets were slipped under front doors and were furtively read by the inmates and discussed with animation. Next came debate in open battle, and generally truth waved the flag of triumph. Francis did not spare himself, and fortunately he was able to share his apostolate with a number of helpers, among whom were the Capuchin Father Cherubino and his young brother Bernard who acted the part of protagonist in debates in which Francis played the role of the one being instructed in the faith. These apostolic activities were followed by the Forty-hours Devotion at Annemasse (1597), the Corpus Christi celebrations at Thonon (1598), even a humble eucharistic congress - and in missionary country, too! Francis expressed the best of his teaching in three remarkable spiritual books: Introduction to the Devout Life (or Philothea, 1608, definitive edition 1619); Treatise on the Love of God (or Theotimus 1616); and the posthumous Spiritual Discussions. He had no wish to be considered a litterateur. His preaching and writing were the result of inspiration, duty to his episcopal office, and demanded by his pressing and urgent apostolate and pastoral experience. The Introduction to the Devout Life belongs to the Savoy period of his episcopate. It reveals Francis de Sales as a director of souls, an educator dedicated to the spiritual good of men and women desirous to live an authentic Christian life within the hurly-burly of their mundane tasks. The Treatise on the Love of God is a summation of Francis' convictions and the fruit of his intense episcopal activity (1607-1616). These were years of direct contact with bishops in Savoy, Rome and France, with priests, with devout souls, with parishioners of the city and of the mountains; and six years of spiritual direction given to the Visitation Sisters. In these ten years Francis' thinking matured and clarified. Writing had become for him a relief from his intense activities, a means of harvesting the fruits of his experience and of communicating them to others. Finally, the Spiritual Discussions (1629), published and edited by (now Saint) Mother Jane de Chantal, consists of the question-and-answer discussions in the fairly frequent meetings Francis had with the Visitation Sisters from 1611 to 1622: it is a kind of community spiritual direction written in a confidential manner. These manuals were written almost contemporaneously, and could be considered as three projections or formulations of the same thought, diversified to accommodate the particular readers. Philothea of the Introduction to the devout life is the Christian woman immersed in the duties and experiences of ordinary life. Theotimus of the Treatise on the love of God is the lay or religious person who wishes to progress further than the simple Introduction to the Christian life and stride towards perfection. Finally, in the Discussions Francis dialogues with the new kind of Religious Sisters he would have wished to introduce into the Church. These three works were culled from the experience of his pastoral activities and are totally directed towards the active life. They constitute a threefold psychological and spiritual journey presented to the Christian within the pressures of life and faith: the `Christian life' is life, movement, and the growth of the person who must deal with the affairs of the present. This indeed marks Francis de Sales as a `modern', and in our own times, our pastoral initiatives are closely linked with his. Philothea and Theotimus were Christians exposed to the influence of the pagan humanism of the age and ran the risk of living their lives without the faith. Our present day suffers from the same problem: it is called secularism. To cope with the inescapable phenomenon of secularism demands that believers accept the demanding structures of the world, but live in them with all the light of their faith and total intensity of charity. Vatican II exhorts them to carry out all their mundane activities, unifying human, domestic, professional, scientific and technical efforts in one vital synthesis together with the religious graces under whose pre-eminent direction all becomes coordinated to the glory of God. A faith that is distanced from daily living and daily duties is an illusion. And Francis de Sales teaches us that this vital synthesis must be one with the heart and love, but according to the diversity of various walks of life. Francis' pastoral and spiritual experience convinced him that there is a spiritual hierarchy among God's creatures. Of course God loves all his creatures, and his Son died for all of us without exception. This truth, though largely forgotten in Francis' day, was one of the Saint's firm convictions. The Gospel call to perfection of love is one and universal, and equal for everyone. However, in practice, individual vocations vary from each other, and each person must respond to individual talents according to particular ability. There are different reasons for this: the diversity of natural aptitudes, character, education, environment, relationships. Such differences occur because of the greater or lesser degree of generosity with which human liberty reacts. Each individual soul needs to be instructed, encouraged, educated according to personal needs. A pastor of souls is well aware that he cannot expect the same result from everyone, and that some have need of more particular attention. Francis de Sales clearly accepted the notion of a Christian élite for whom it was well worthwhile to give special attention and time. Indeed he wrote his books for such people. However, it must be stressed that this was in no way a kind of ‘racism' within the Church; this élite was of a spiritual nature and nothing to do with social ladders. It derived simply from love and not from positions of privilege. Thus Francis searched for it everywhere: in the world, and in convents; in the fields, in the mountains and in the cities; among priests and among the laity; among rich and poor and the unlettered. It was enough to have a generous heart capable of loving; it was enough to be Philo- theòs or Theo-timo, that is, devout, or God-loving. An obvious remark will be made that Francis found these elect souls particularly among women. He exercised a great influence over them, and found it easy to help them with his pleasant reserve. He was greatly concerned with their spiritual education, and in so doing was countering the general antifeminist current of the times. Many of his contemporaries criticised him and accused him of exaggerated concern for them. On one occasion the famous preacher, Bishop Adrian Bourdoise of Parish remarked to him, `You are a Bishop, and you spend too much of your energy helping women'. Francis’ succinct reply was, `Gold is fashioned by a goldsmith; the potter moulds the clay'. It should further be noted that Francis considered that to concern himself with those elected souls was a way of practising charity and raising all Christian people to God. From those whom God has given much, much will be expected and they will have the duty of giving more to their fellow creatures, and working as much as possible in unity with them. All the devout souls must collaborate in this elevation, whatever their social level may be, each one working where Providence has placed him: the Kingdom of God calls for the active contribution of all. Francis inscribed the faithful in various confraternities and he himself founded a number of them. The cream of the intellectuals he united in the Florimontane Academy. At the same time we too today strive to have them participate in similar apostolic movements and Gospel activities. In practice it is necessary to bear in mind the personal situation of each individual. Every soul has its own history and secrets, is loved by God every moment, is chosen to come to him just as he is, and helped to take the necessary steps to progress in holiness. We need to face up to what we are, and the spiritual director must work on each individual as he finds him. It is easy to be tempted to bundle all souls into the same situation and oblige them to walk the same path at the same speed; and it is easy to cancel the resting places in our impatience to arrive at the goal. Francis de Sales reminds us that every soul has its own grace, its own lights, its own inspirations, and its own rhythm; and the whole Christian life is a journey with its progress and regress, it’s time for resting and time for forging ahead, it’s time for fast progress and time for slowing up. The love of God envelopes us and graces us as pilgrims on the move. And the dialogue between God and the soul is always a personal affair in which the unfathomable mystery of divine predilection is at work. The important thing is to forge ahead and not stagnate in mediocrity. We now come to the very foundation of the spiritual life according to Francis de Sales. We shall endeavour to determine the nature of the love that we must live, the laws that govern its exercise and progress, its pedagogy and its fruits. God is love in himself and in his search for man; and You have created us for you, O Lord. We see that man is made for love; there is in him a secret readiness and a profound longing for the love of God. The very meaning of the universe, of human affairs, of the destiny of every person, is the loving encounter between God who seeks man and man who seeks God. An ancient monk once said: `I have spent forty years in search of God, and when I thought I had found him, I discovered it was he who had first searched for me'. The problem, the tragedy, is simply that we humans can fail to recognise (nay, even repress), our most profound hunger, and turn away from God. The very nub of Salesian doctrine can be summed up as heart and love. In Francis' words, `The heart is the sanctuary and source of love' The symbolism of our human heart of flesh that keeps our bodies alive, helps us understand that `deep down in our hearts' means our free capacity to love. Of its very nature, this capacity does not distinguish its object: it is possible to love either what is degrading or what is ennobling. However, there is a `reserved area' in our hearts for our relations with God. Francis, like other great divines, calls this `the very nature of the heart', or even ‘the pinnacle of the soul, the apogee of the spirit'. It is there that God makes his inspirations and his intimations felt. In modern terms that more or less fit the situation, we could say that the depths of the heart constitute the conscious making of significant choices and decisions; it is the person himself at the very core of his individual personality. Here is man at the crossroads of existence: in what direction will he set his heart? whither his capacity to love? whither his self-donation? whither to issue forth from himself? whither his rapture, his ecstasy? Here we are face to face with the mystery of our free will. In Salesian psychology freedom is the power of the deliberate will to choose what shall be the object of its love. `The will', writes Francis, `does not love unless it chooses to love; and among the many loves that present themselves, it can bind itself to the one it chooses. '7 In fact, judgements and decisions must take account of `passions and both sensitive and sensual appetites'. It is `in the depths of our hearts', where God is to be found in faith - it is precisely there that we shall encounter `the war that we experience every day of our lives'. It would take too long to describe in these few pages how Francis would have the Christian seek to achieve true union with God - and the various forms and stages involved therein. Francis de Sales adapts the biblical and traditional symbolism of conjugal love, and comments on the Canticle of Canticles. He rejects out of hand the belief that life is merely mechanical habit and that a juridical approach is all that matters. Christian living is primarily a personal matter, a life of private and intimate relationships between the believer and his God. That is exactly what devotion (or the devout life) is. The wilted spirituality of so many Christians stems from the fact that they have been taught to adhere only to doctrine and morality, and not primarily to a mystique. We need to love the Supreme and Infinite Love, to dialogue with God in a wonderment that is forever new. The mystique of Francis de Sales, as already mentioned, is essentially a mystique of Christian activity, of Christian living. The heart is the actual person making private and profound choices. If the heart chooses God and lives united to one, love will of necessity permeate one's whole being and enliven its manifold richness; and all one's practical living will be imbued with the supernatural. In particular, Francis exalted human sensitivity. Left to its own resources it is in danger, but in expressing true love it becomes invaluable. Rev Mother de Chantal wrote, `He was not exempt from sentiment and the emotions of passion, nor was it his wish to be so'.9 Indeed he wrote of himself that he was most tender-hearted, and that no one `loved more cordially, compassionately, affectionately' than he; indeed God had made him so. He adds that charity does not arouse all the other virtues in the same way. It prefers some of them, in which it manifests itself more explicitly. Hence we have the procession of Gospel virtues about which he has written unforgettable pages, referring to them as ‘virtues that must enrich with their qualities the acts of all the other virtues'. We must prefer the virtues that fit in best with our personal situation and the duties of our state of life, `the better ones, not the most noticeable ones'11: humility, `awareness of our deficiencies and frailties'; and to this virtue he dedicated four chapters of his Philothea,- gentleness, which is humility towards our neighbour and the flower of fraternal charity, and simplicity; and then the `important virtues' of obedience, chastity and poverty. The love of God lifts the human heart into the realm of a living and active faith. In the diversity of situations and virtues we need to guard this love carefully, to preserve it and perfect it, for it is love that guarantees the true value of our actions. This is the important principle of uprightness of our aspirations, the purification of our intentions. Francis tells us that `we do not generate and achieve perfection by means of a multiplicity of efforts; rather what matters is the perfection and purity of the intention we have when we carry them out'. One further thought. It is easy to see that this teaching, though seemingly lofty and grand, does not in any way repudiate what the Gospel demands. On the contrary. We have only to recall the smiling, appealing, joyous demeanour of the Saints. They chose to lead a stricter life than others, and their very freedom showed clearly that they had assuredly mastered their human weaknesses. It is plain that we should have confidence in those who are holy and joyous since the love they preach leads to greater sacrifices. To love is to renounce oneself, and total renunciation of self demands total love. It is worth noting that one of the books that St Francis de Sales held in special esteem was the Spiritual Combat by Lorenzo Scupoli. Francis knew that strife is part of life; but he renewed ‘religious spirit' by transferring austerity from external religious observance to interior religious observance. In his own words: ‘We must discipline our hearts, not our bodies'. Francis would have us eliminate all self-seeking. In a particular manner we must cultivate fidelity to prayer, frequent confession, and make a constant effort to be vigilant with ourselves and our intentions. Then he surprises us even further: to achieve such courage it is sufficient to love and desire to love ever more and more. The spiritual life is nourished by fixing our eyes on him who loves us, on Jesus crucified. The hallowed humanism of Francis de Sales is fundamentally a Christ- centered humanism, with Jesus the Man-God in our sights, the perfect man and the true God, an aspect that the French school was to emphasise so enthusiastically. Francis shared St Bonaventure's thinking on the reason for the Incarnation: God sent his Son not only to expiate sin, but first of all to possess a creature who could be totally loved, and from whom he could receive love in its totality. Francis maintained that God created angels and humans `as though to keep company with his own Son',creation's first-born, with the basic task of loving and praising the Father of heaven. The whole devout life draws its inspiration from a deep personal love for Jesus Christ. For I decided to know nothing among you except Jesus Christ and him crucified. Francis often repeated this expression of love and commented on it at length in his writings and discourses. He maintained that we should not only contemplate Jesus as the perfect model and strive to resemble him in an external manner; for more than a model, Jesus is our living principle and origin. Christianity is the act par excellence of putting on Christ 18 through the grace of the Holy Spirit. And if the totality of man is his heart created for God, then the totality of Jesus Christ is his pierced Heart from which issues the blood of our redemption and the living water of life eternal. We need not marvel, then, that the great devotion to the Heart of Jesus was renewed in the Church in a monastery of one of the Daughters of St Francis de Sales at Paray-le-Monial, St Margaret Mary Alacoque. The founder of her Congregation had prepared the ground. Certain external contrasts in the two Saints have already been noted in these pages. Francis was born into a noble and wealthy family and had the opportunity to pursue extensive university studies. He was appointed to high positions. Those whom he met were impressed by his dignified and solemn character. John Bosco, on the other hand, was of peasant stock, knew what it was like to live in poverty, had to study under arduous circumstances and habitually exuded a lively and smiling confidence. Francis' holiness displayed a coordinated simplicity that was gentle and natural. John Bosco's holiness was renowned for miracles, visions and extraordinary enterprises. Such striking contrasts between the two Saints certainly invite our attention, but, all things considered, they are only superficial matters, and the similarities and parallels are more numerous and impressive. Don Bosco and Francis de Sales were actually co-nationals. This is a fact that is usually overlooked, though it is one of the reasons why they were so closely related. Francis was not born in France, but in the duchy of Savoy; and from the mid-sixteenth century up to the Treaty of Turin in 1860 (which ceded Savoy to France) Savoy and Piedmont belonged to the Sardinian States with Turin as the capital. During young Bosco's formative years, Francis de Sales was venerated as the national saint; clergy and aristocracy spread his culture and the knowledge of his enterprises. Indeed, even Cavour and his family claimed kinship with the de Sales family line. Don Bosco began to know and revere Francis in the Seminary at Chieri, and then at the ecclesiastical boarding college in Turin. These institutes had been placed under the patronage of St Charles Borromeo and St Francis de Sales; and it was here too that the learned and saintly Fr Joseph Cafasso taught - a man imbued with the spirit of St Francis and who encouraged Don Bosco's apostolate and was his confessor for twenty years. Bosco's ordination to the priesthood on 5 June 1841, the fourth of his resolutions was, In all things I shall be guided by the charity and gentleness of St Francis de Sales. Later on he chose as his motto: Give me souls; take away all else, and when explaining this saying to Dominic Savio, he simply mentioned that the maxim had been used by St Francis de Sales. because our ministry demanded great calm and kindness, and had therefore been placed under the protection of this Saint. We wanted Francis to obtain from God the grace that would help us to imitate him in his remarkable gentleness and zeal for souls. A further reason was to place ourselves under his protection, so that he would help us from heaven to imitate him in his combating the adversaries of the Church, who were gaining numbers in Italy and especially in Turin'. In his Regulations of 1847 Don Bosco was to speak of the imitation of Francis `in his charity and kindly demeanour', an attitude so necessary for the success of his educative work. These words are certainly most revealing. 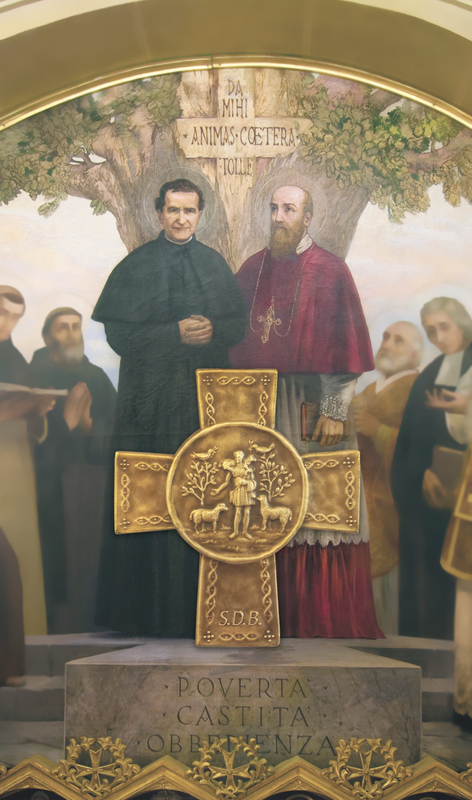 We know that Don Bosco also admired other great Saints noted for their great pastoral work: Philip Neri, Charles Borromeo, Vincent de Paul, Alphonsus Liguori. However, for him Francis de Sales was number one: for his intuition, and his reasoning. He saw him as the Saint who fitted in best with his own spirit and mission, the most suited to illumine and inspire him in his priestly and educative apostolate. In so many ways Francis had faced and conquered similar difficult problems, and he was thus a beacon light indicating the best way to follow. It will be helpful to gain a better understanding of this affinity of John Bosco the disciple with Francis the model. the Christlike gentleness that imbued his zeal: his charming manner, his patience, his extraordinary sensitivity. The vital source of both these qualities is a deep, solid and decisive conviction, namely, that love is the totality of God and the totality of man. Thus it is possible to group the affinities found in our two saints under the three following aspects. The first characteristic that both Saints shared was their pastoral nature. As already recorded above, Francis was an intellectual, a writer, a theologian - but first and foremost he was a Bishop, and well trained for this office by four years of heroic priesthood. He was a man of many talents, and consecrated himself heart and soul to his duties and responsibilities as Bishop. He was utterly selfless and never failed to give his all to his flock. We read in his letters to the Baroness de Chantal that for this he would refuse all further dignities. As befitted a good shepherd he dedicated himself tirelessly to celebrate, sanctify and govern always for the good of his people, regardless of their social standing. All his writings were inspired by his episcopal activities. It was as a Bishop that he guided so many Philotheas and Theotimuses along the path of devotion, and founded the Congregation of the Visitation. He wore himself out in his total dedication to this active apostolate, in accordance with his episcopal motto: Chosen by God, assigned to his people. As for Don Bosco, his priesthood demanded an heroic preparation. It permeated and defined his whole life. He never wished to be anything other than a priest, everywhere and always - charismatically oriented towards the young, especially those in need. His aim was not to be an educator who happened to be a priest, but a priest who exercised his priesthood in the educative mission. It was as a priest that he approached the young and led them to Jesus and to eternal life; it was as a priest that he founded the three Families of his co-workers and disciples and extended his apostolate to the mission fields. Like Francis, he too lived and wore himself out in his untiring zeal. both were noted for their friendliness and deep concern for educative and Christian guidance - each according to his own special vocation. Both were religious founders and taught others to walk the path of sanctity. Both Bishop and Priest had loved and served the Church. Both had constantly devoted their efforts to defend sound doctrine, to encourage other shepherds, to venerate the successor of Peter - and frequently in difficult situations. More than once they both paid dearly for their loyalty and obedience in varied and harsh sufferings. Both too had to cope with the vagaries of political problems, and in delicate situations both were always outspokenly true ministers of Christ. Another thing to note about these two great men of action is that, although they tackled so many enterprises, and generally with great success, they did not need these activities to express themselves. Those who knew them were always struck by their interior calm, their constant serenity, their smiling tranquillity, and their ability to deal methodically with matters, prompted only by their profound love of the God they wanted to serve. Obstacles did not discourage them: they expressed their fidelity in a patience that was certainly not resigned but very active. There was always about them a serenity and that peace of God, which passes all understanding. Love bears all things, believes all things, hopes all things, endures all things... Love never ends... God is love, and he who abides in love abides in God, and God abides in him. Our two Saints never ceased to meditate and live these words, Francis in a more reflexive way, Don Bosco in a more intuitive way. Francis, like St Augustine, was called the `Doctor of love', and Don Bosco was called by Pius XI a `giant in charity'. The God they adored and preached is the Father so full of tender mercy, and Jesus the Good Shepherd who gives his life for his sheep. The Treatise on the love of God tells the story of this patient divine love; and Jesus reveals this love through a Visitation Sister. Don Bosco taught his young charges, `You are the light and the love of the God who created you and who created you for your happiness'. The last of Don Bosco's labours was to build the Church of the Sacred Heart in Rome, as though to proclaim that all his work had the sole aim of being an expression of divine charity. And what was their vision of man? Our two Saints saw man most vividly as `oriented Godwards', destined for eternal joy, capable of an earnest response to his love. The substance of man is his heart; and his vocation is to love. The function of man, of the universe, of human affairs, and of every personal destiny is the loving encounter between God who seeks man and man who seeks God; and from this love there flows the willing encounter of man with his neighbour. Genuine education then is the initiation to true love; salvation begins when love begins, and to love there is no need to await extraordinary occasions: it is possible always and everywhere, in our duties and in our daily encounters. educator, must above all else love `with deeds and in truth' those to whom he is sent. Before being translated into action, the apostolate must be a personal relationship of love; indeed every activity not suggested by love is doomed to failure. This conviction prompted Frances de Sales and John Bosco to exhibit a number of attitudes that could be called typically `Salesian'. In the first place we note what has been called their `humanism', their respect for the innate dignity of all of God's children. Both Saints were optimists, with a radical confidence in man and his natural and supernatural capacity. Both possessed a deep understanding of man, had exalted ‘human' values and virtues, had made room for emotions, for joy, for culture, for progress. They were convinced of the usefulness and value of action, convinced that every person could be taken in hand; their calling was above all to help people develop their interior talents: their intelligence, their freedom, their heart, their faith (Don Bosco referred to these activities as reason, religion and kindness), with a patience that could wait, hope and keep trying in the face of failure. In every good shepherd who loves his sheep and seeks to be loved by them so as to lead them more easily to God, there is a very special relationship, which Don Bosco summed up in his well known term `kindliness' - in other words, an infinite respect for each person, including the poorest of the poor, and the least likeable ones. The opening gambit must be a pleasant welcoming smile, a kindness that tries in all humility to be affable, a sense of humour, infinite patience and forbearance in the face of faults and ingratitude, and an invitation to friendship. In this way Francis de Sales and John Bosco surrounded themselves with an aura of extraordinary pleasantness and congeniality. They are remarkable among all the Saints as being in the front row of those who had this aura of attraction, and who were loved by all. One has only to think of the triumphal receptions of our two Saints when they each visited Paris. Another aspect of their particular charity manifested itself in a practical realism and a dauntless courage. True love is not romantic but realistic, full of practical wisdom. It accepts others as they are, and tries to give them what they need here and now. It adapts itself to circumstances... Both Francis de Sales and John Bosco in their apostolate ran a course of popular apologetics in their preaching and writing. Their propositions were well balanced, their language simple, their presentation imaginative, their style engaging and practical. They did not expect from their flock a holiness that was immediate or austere; they encouraged them to draw nearer to God in a steady, practical and unexaggerated practice of virtue; they sought to instil in them a conviction of daily fidelity. Both very soon became excellent counsellors. In all of the above apostolic efforts they never ceased to be impelled by love; they kept up to date and had no fear of trying out new techniques of presentation, calmly discussing various aspects of contemporary thought and action. Francis, in his Chablais mission, used leaflets and pamphlets slipped under the doors of his `congregation', and would later be proclaimed the patron of journalists. Don Bosco branched forth with a popular press and is truly a staunch champion of the Catholic printing press. Indeed in our modern times, both could be considered patrons of social communications, for both had great confidence in the value and progress of the media. In their own lifetime their own principal works went through dozens of editions. Indeed all aspects of their apostolates are marked by courageous boldness: the founding of the Visitation Sisters and the Salesian Society both surprised the Rome authorities, and the launching of the numerous Salesian missions must have seemed, humanly speaking, veritable acts of folly.